ARP flywheel bolts. Set of 6 used for all Ford V8 engines. ARP pressure plate bolts. Set of 6 5/16" x 18 bolts. Exact reproduction top cover bolts. Set of 10: 8 short and 2 long. 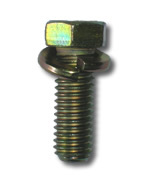 Grade 8 toploader mounting bolt with lock washer. Set of 4 used to bolt toploader to bellhousing.